Radioisotope Center in Graduate School of Agricultural and Life Sciences had been renewed at 2004. Tracer work using isotope for agricultural study had started as early as the 1950s, mainly in the fields of plant nutrition and fisheries. However, with the recent and rapid development of gene engineering, an isotope has been used mainly to label DNA or RNA. Besides gene, engineering, isotope labeling of chemicals or cells are also performed. 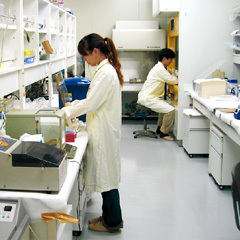 Since, many researches require using isotopes, nowadays, the laboratories using isotope are widely spread among almost all the departments in the Graduate school. About 600 people ragister to use isotopes, each year and most of them are graduate students, senior researchers or academic staffs. There is an administration office in this center. To use the isotope following the strict regulations in Japan, everyone using isotope is registered and radiation safety program is provided for each user from the office. Everyone must attend two kinds of lectures, both by the university and the School. Health check and radiation monitoring is also performed for each user. Every user have a ID to enter this facilities and administrative records are accumulated. Two academic staffs are included in the center who, through their research and training, can advise researchers the way of using isotope or provide new information about the application of radiation or isotopes.